The Council of Fashion Designers of America, Inc. (CFDA), which represents all of the major fashion and accessory designers in the U.S., has been creating yearly resolutions each January to address the most important issues facing the industry. Last year’s resolutions were “mindfulness,” “inclusivity,” “exposure,” “well-being” and “growth.” This year, the resolutions have become more specific, zeroing in on environmental, gender, racial and body issues. According to our diversity reports, 2018 was the most inclusive year on record. For the most recent runway season (Spring 2019), New York Fashion Week featured a record 44.8 percent women of color. Compare this to the 36.1 percent average across New York, London, Milan and Paris and it’s clear that American designers are leading the charge towards racial inclusivity. The Fall 2018 ad campaigns were also the most racially diverse ever, though they lagged behind the runways, with 34.5 percent women of color. The CFDA, which is “committed to making the future of fashion sustainable” joins other recent efforts, including a global commitment to reduce plastic pollution signed by Burberry, H&M and 290 organizations worldwide and the UN’s climate change initiative, which follows the Paris Agreement in 2015, that plans to cut 30 percent of greenhouse gas emissions by 2030. The fashion industry still struggles with size inclusivity. For the Spring 2019 season, 49 plus-size models (2.2 percent) walked in 12 shows in New York, a vast improvement over last season’s 27 in 8 shows (1.2 percent) and Spring 2018’s 34 in 12 shows (1.3 percent) but still a comparatively dismal number. The Fall 2018 ad campaigns fared even worse, in fact, they hit a record low. After three seasons of plus-size castings remaining mostly static — with 10 in Spring 2018, Fall 2017 and Spring 2017, respectively — Fall 2018’s campaigns featured only seven models in the category. Let’s hope the CFDA can encourage more of its member designers to embrace size diversity in 2019. Resolutions are notoriously hard to stick to, here’s hoping the fashion industry follows the CFDA’s lead and makes significant progress throughout the year. 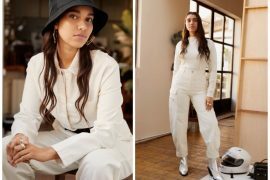 The post Resolutions: The CFDA Wants Designers to Focus on Sustainability, Body Positivity, Diversity and Equality in 2019 appeared first on theFashionSpot.